Your Android smartphone has a limited storage space and it is getting on the wane as you use your smartphone to taking photos and recording videos. You need to manage the data stored on your smartphone to keep having enough storage space. AnyTrans is a great tool to manage your Android data via desktop. Managing Android data via desktop is way easier than smartphone itself. You can easily navigate between locations or switch between windows using mouse. Android smartphones also support multitasking. However, since Android smartphone screen has a limited size, it almost impossible to open multiple app windows on single screen. In addition to managing data, you can also use AnyTrans to transfer data from an Android device to another one (even iPhone). This feature it pretty useful if you are looking to buy a new smartphone. You can take the data from your old smartphone to the newer one — like text messages, apps, and contacts — along with you. No more pain to install every single app or manually transfer important text messages. If you ask your friends something like “is there a tool to transfer data between two Android devices?” Or “can I manage my Android data via desktop?”, chances are they will suggest you to use AnyTrans. Apart from Android, AnyTrans is also available for iOS. It is a software brand that has focused on mobile data management for both Android and iOS users for years. You can manage your Android data via desktop since AnyTrans for Android has desktop application. If you are unwilling to install a desktop app, you can also access AnyTrans directly on web browser. AnyTrans for Android is available in three platforms: desktop, web and Android itself. 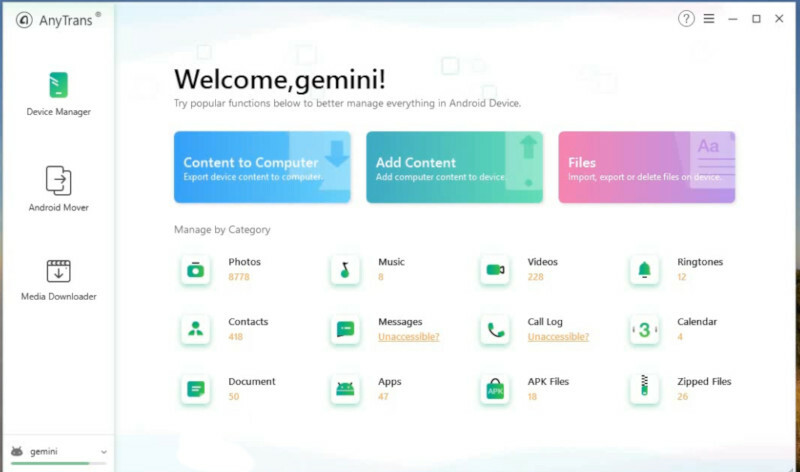 This brings you, the user, a more convenient and in-depth content management as you will have direct access to your Android data and files for all cases. Here are 4 key things you can do with AnyTrans for Android. Transfer data from computer to Andriod device and vice versa. Backup Android data to computer. Manage Android data via desktop. Transfer data from an Android device to another Android device or iPhone. The best thing about AnyTrans is that you can connect your Android device to your computer wirelessly by taking advantage of Wi-Fi. 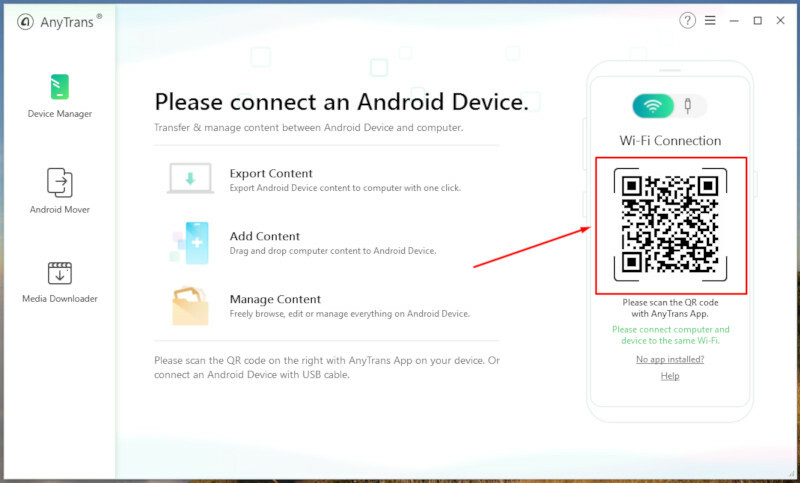 Simply connect your Android device and your computer to the same Wi-Fi and scan the barcode on the AnyTrans app on your desktop using AnyTrans app on your Android. Once connected, you can start working with AnyTrans. Whether you want to backup your Android data to computer, transfer data between two Android devices or copying files from computer. There are three main menus available on the AnyTrans desktop app. Device Manager is a where you can manage your Android data. Once you have connected your Android device, you will see the following interface. As you can see on the screenshot above, AnyTrans puts together the data on your Android smartphone into 12 categories. Above the categories, there are three tabs which you can use to perform certain act. The first tab (Content to Computer), allows you to export your Android data to computer. 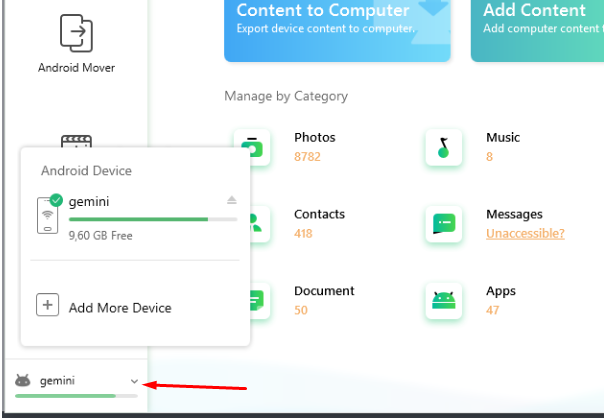 You can choose this tab if you want to backup your Android data to computer. 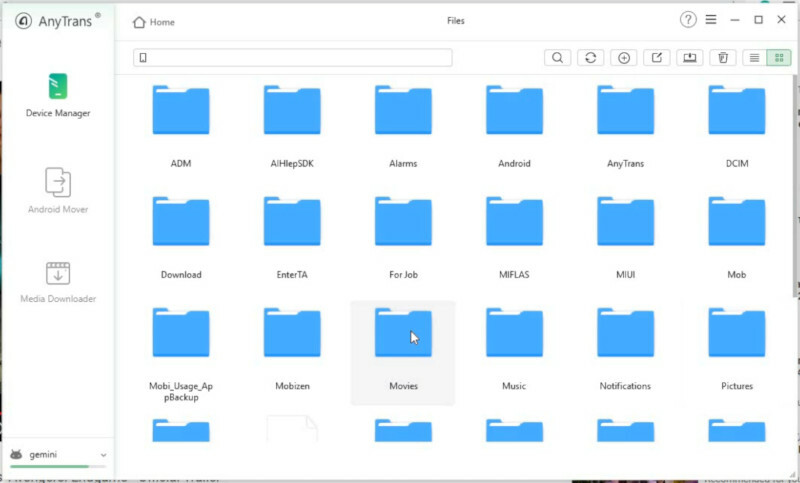 To copy files from computer to Android device, you can select the Add Content tab. To manage your Android data, you can go to the Files tab. On this tab, you can move files from certain location to another one, copying files, deleting files and so on. AnyTrans also allows you to export your contacts, text messages, cal log and and calendar into CSV file. You can use this feature for a certain purpose. For instance, you can export contacts into a CSV file and import it to Excel or other app with for a marketing purpose. You can find this feature on the Settings menu of AnyTrans, which you can access by clicking the three-line icon right next to the window controller. Android Mover is a great feature offered by AnyTrans that allows you to transfer data between two Android devices. This feature is extremely useful if you want to upgrade your device. 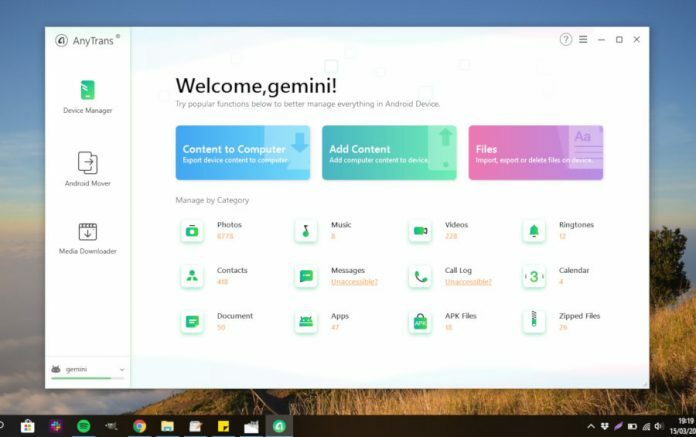 With this feature, you can, for instance, seamlessly transfer data from your old Samsung smartphone to the newest Samsung flagship Android smartphone, Galaxy S10. This feature is also helpful if you want make a switch from iPhone to Android or vice versa, from Android to iPhone. 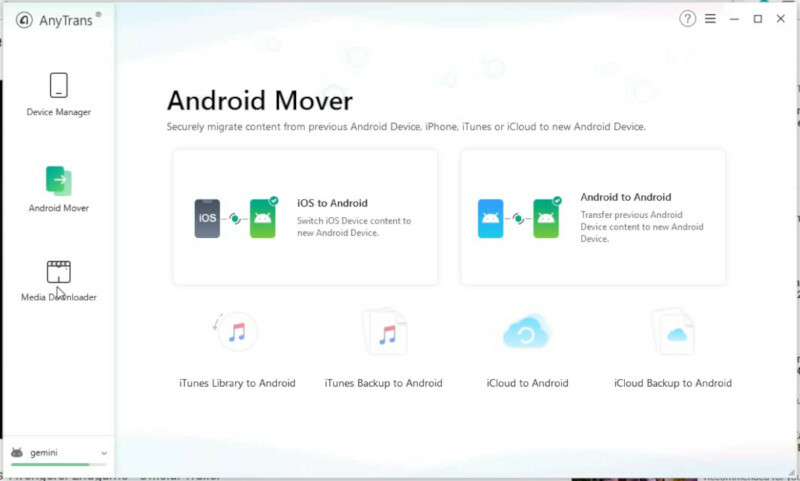 To transfer data from an Android device to another one (or from Android to iPhone), you need to connect the two devices you want to transfer data between. To add a new device, you can click the tiny arrow icon on the bottom-left corner. You can also click the same icon to disconnect your Android device. Sometimes when watching a video on YouTube on Vimeo, you want to download it so that yo can re-watch it offline any time you want. AnyTrans knows what’s on your mind. 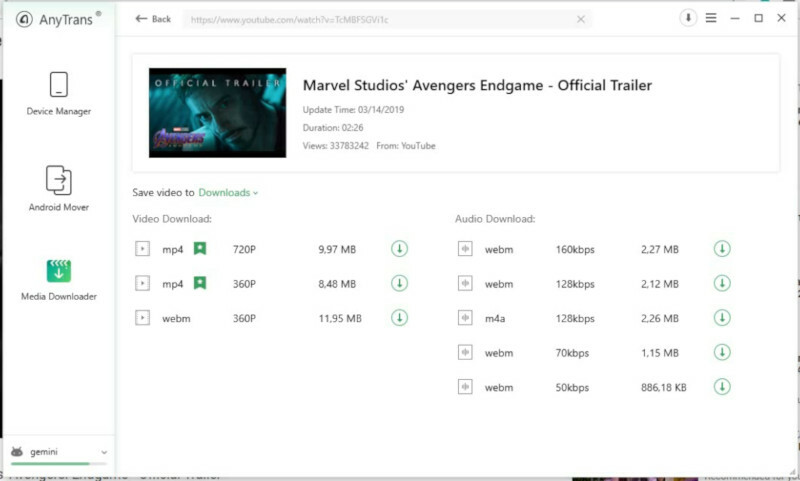 This tool offers a Media Downloader feature to allow you download multimedia files from sites like YouTube, Vimeo, Soundcloud, and even TED Talks. You can simply click the Media Download menu on the left panel and paste the URL of the content you want to download and hit enter. Seconds later, AnyTrans will provide several download options. Once the download process is done, you can instantly transfer the downloaded file to your Android smartphone. Smartphone is continuously evolving. New smartphone models come nearly every month. There will be a time where you have to upgrade your smartphone, even if you don’t want to do it since not all apps can run on older Android versions. You don’t have to re-install all of your apps from Google Play every time you want to make a switch from one Android device to a new one. AnyTrans for Android can help you to transfer your Android data, including apps, to another Android device. Or, if you want to make a switch from Android to iPhone or vice versa, you can also use AnyTrans to transfer data like messages and contacts. In addition to transferring data, AnyTrans can also be used to manage Android data via desktop and web. You can easily backup your Android data to computer and transfer files from Android device to computer or vice versa. One thing to note, AnyTrans for Android only works on Android 5 and the higher versions.